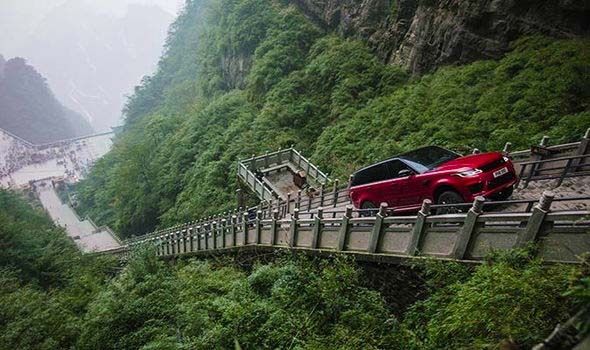 Range Rover Sport PHEV climbed a 45-degree, 999-step staircase in a world-first Dragon Road challenge. The plug-in hybrid SUV completed the incredible challenge at one of China’s most famous landmarks, Heaven’s Gate. Heaven’s Gate is a natural rock arch located in the Tianmen Mountain in the Hunan Province of China. The Dragon Challenge comprised of the dizzying 99 turns and 999 steep 45-degree steps that lead up to the famous landmark. 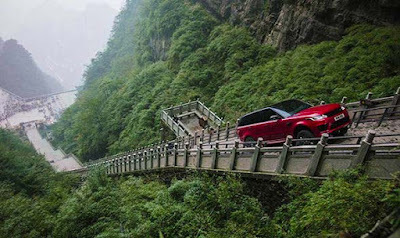 Range Rover’s new hybrid SUV became the first vehicle to ever climb to the top of the stairs of the natural rock arch. Behind the wheel of the P400e was Panasonic Jaguar Racing’s Ho-Pin Tung. When Ho-Pin Tung was tackling the stair-climb prtion of the challenge the car’s Terrain Response 2 system was set to Dynamic mode. Dynamic Mode sharpens throttle response, changes gears at high revs, and engages dampeners to help the car feel planted. Powering the new hybrid Range Rover Sport is a 300PS Ingenium petrol engine and 116PS electric motor. Together they produce 404bhp and 500Nm of torque which helped to propel the car to the top of the steps. Ho-Pin Tung said: “I’ve experienced Formula E, Formula 1 and won at the 24 Hours of Le Mans but this was without doubt one of the most demanding driving challenges I’ve ever faced.